“Chimera,” a dark and jangling intro, that leads the listener into what is to come. “Doctor Of Plague,” a swaggering beast that takes its full measure with heavy riffs and beastly choruses. “Black Song,” another beastly number with full throttle dedicated to it. “Towers of Silence,” brings a new energy, somewhat touching toward Black Metal, whilst delivering inferno. “Forged in Ice,” a slow moving beast, that winds its way this way and that, slowly growing with every passing turn. “Kill The Light,” a fast moving rocker. 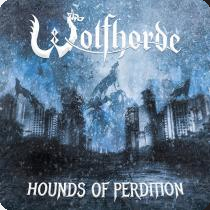 “Hounds Of Perdition,” symphony brought to light and dancing along the pathways. The album is out on 11th January, via Inverse Records.